The giant berg A-68 looks finally to be on the move. Recent weeks have seen it shuffle back and forth next to the Antarctic ice shelf from which it broke away. 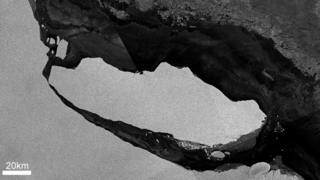 But the latest satellite imagery now indicates the near-6,000 sq km block is swinging out into the Weddell Sea. A wide stretch of clear water has opened up between the berg’s southern end and the remaining Larsen shelf structure, suggesting A-68 is set to swing around and head north. This is the direction the Weddell currents should take the iceberg. Polar experts expect the trillion-tonne block to essentially bump along the shelf edge until it reaches the great eastward movement of ocean water known as the Antarctic Circumpolar Current. This would then export what is one of the largest bergs ever recorded out into the South Atlantic. How far A-68 actually gets along this predicted path is anyone’s guess, however. The berg already shows evidence of fragmentation at its edges. These bits – they carry the designation A-68b, A-68c, etc – all still float close to their parent. But in time they will get separated, and it is entirely possible that big segments with deep keels could get anchored in shallow waters and become semi-permanent “ice islands”. A-68 calved during mid-winter and it required radar satellites – such as Europe’s Sentinel-1 spacecraft – with their unique ability to pierce cloud and darkness to keep track of developments. With the return now to longer days in the Antarctic, opportunities are increasingly opening up for high-resolution optical satellites to take a close look at the state of the berg. And new imagery from the Spanish Deimos-2 spacecraft shows how the initial sharp edges of the block’s northern-western corner have been lost. Scientists are not just looking at the berg; they also continue to monitor the Larsen Ice Shelf. They are checking to see if its behaviour has changed since the calving. The shelf is the floating protrusion of glaciers coming off the Antarctic landmass, and the ejection of such a large section of its structure could potentially trigger further fracturing or a change in the speed of ice flow. So far, however, there is little evidence of either. When A-68 moves clear of its birth position it will reveal seafloor that probably has not been free of ice cover for 120,000 years – during the peak of the last warm phase in Earth’s history known as the Eemian. The area has already gained protected status from the Commission for the Conservation of Antarctic Marine Living Resources (CCAMLR). This gives scientists priority access and keeps fisheries activity at bay for a minimum of two years. Previous research in locations uncovered by departing bergs has found new species. Expeditions to visit A-68 this coming Antarctic summer season are in the planning stage.